Concussions may seem benign on the surface, but they can have lasting effects. They are not just a hazard for elite sports people but for children too. "It felt like my brain hit the side of my head" is a common description. Headaches, neck pain, dizziness, anxiety, and fatigue are all common symptoms. As osteopaths we take any form of brain injury seriously, and it's our job to make sure the brain is happily floating within the cranium in its protective fluid. Read more about concussions and a case history from Kate. As an osteopath working in the cranial field I have been treating quite a number of patients with the diagnosis of concussion. Concussion, also known as mild traumatic brain injury (mTBI), is typically defined as a head injury that temporarily affects brain function. You can have a concussion even if there was no loss of consciousness at the time of the injury. You can also suffer a concussion following a sudden deceleration injury resulting in a sharp jolt to the head; it doesn’t have to involve a direct blow to the head. Symptoms may include nausea, headaches, fatigue, blurred vision, trouble with thinking, concentration, memory, mood changes and sleep disturbances. Symptoms can be temporary, or go on for weeks or months. One patient, a 40-year-old female, consulted me for treatment following a blow to the back of her head by a boogie board when being dumped by a wave in the shallows. Her initial symptoms included a pain in her head and ears and an aversion to bright light. It wasn’t until 2 days later that she developed nausea, migraines, dizziness, light headedness and visual disturbances. She reported feeling extremely fatigued, becoming easily irritable, was unable to multitask and got easily overstimulated. Her symptoms would also worsen without sufficient sleep and rest. 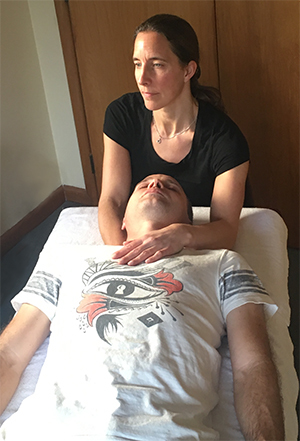 Initial treatment focused on taking the shock out of her system including releasing diaphragm tension and calming down the sympathetic (fight-or-flight) nervous system, as well as releasing restrictions in the neck, spine and cranial bone sutures resulting from the impact. The mechanism of concussion involves a primary and secondary phase of tissue injury. The primary injury is immediate, resulting from acceleration/deceleration forces that cause mechanical damage. Secondary injuries occur at the cellular level, indicated by neuronal cell membrane disruption and axonal stretch.1 This can cause “debris” in the brain which then has to be cleared away. This clean-up is performed by a lymphatic system of the brain called the glymphatic system, which is most active at night when we are asleep.2,3 This is one of the reasons why getting adequate rest and sleep following an mTBI is so important and is another focus of osteopathic treatment for this condition. Also, to help with the glymphatic and lymphatic drainage for this patient, releasing the dural membranes (the membranous covering surrounding the brain and spinal cord) and aiding the arterial blood flow and venous drainage of the cranium, neck and upper thorax was important. The patient reported that her headaches resolved quite quickly following osteopathic treatment. The nausea and fatigue would come and go depending on her activity level. Treatment was over a period of months and this patient took a multi-disciplinary approach to her treatment and recovery. She is now almost back to her pre-injury “normal” and has been able to introduce long distance running back into her life, which was her passion prior to the concussion injury. I asked her to summarise how osteopathy had helped her recovery. "Osteopathy made a huge difference in my recovery from concussion. The most straightforward way it helped was to re-align my neck. I can’t explain most of the actual physical help osteopathy made to the many injured parts of my brain but I know that after each treatment my nausea, headaches, concentration and fatigue were improved. Every time my recovery plateaued, a treatment would get it moving again. But I think beyond the physical differences that osteopathy made, was how it helped me emotionally. Osteopathy helped me recover from the trauma and the fear as well. It helped me stay calm so I could focus on all the activities I needed to do to progress my recovery." Concussion severity and symptoms can vary widely from one person to the next, and only about 15% of patients with mild concussion have long-term complications.1 However, it is important to take any head injury seriously and to avoid more knocks to the head during the recovery phase. 1. Mechtler LL, Shastri KK, Crutchfield KE. Advanced neuroimaging of mild traumatic brain injury [review]. Neurol Clin. 2014;32(1):31-58. doi:10.1016/j.ncl.2013.08.002. 2. Jessen NA, Munk AS, Lundgaard I, Nedergaard M. The glymphatic system: a beginner’s guide. Neurochem Res. 2015;40(12):2583-2599. doi:10.1007/s11064-015-1581-6. 3. Xie L, Kang H, Xu Q, et al. Sleep drives metabolite clearance from the adult brain. Science. 2013;342(6156):373-377. doi:10.1126/science.1241224.